Girls, its time for some honesty. I’ve got to admit that I’m really pushing myself out of my comfort zone with this outfit post and I don’t know whether to feel exhilarated or frightened by it. I’ve never worn a bodysuit before but I wanted to show how it can be worn and styled but in doing so, I’m showing more of an area of my body that I’m not so confident with and that’s my tummy. You can read about that in this post. While I’m not completely confident about it, I’ve decided to publish this post anyway which is how you’ll now be reading this. Its actually quite liberating to step outside of my comfort zone, say FU to societies body standards and pose here with a very apparent VBO (visible belly outline). This is me and I’m certainly not ashamed of who I am so its about time I showed that! Like I said, I haven’t worn a body suit before but when I was given the opportunity to try one out, I decided that it was about time for me to see what all of the fuss was about. The reason why I haven’t worn a body before was because I couldn’t see where my wardrobe was in need of one as I never wear my tops tucked into my bottoms. Bodysuits are absolutely ideal if you want to wear something tucked in and to have a smooth and sleek silhouette because they fit to your curves without being baggy or hanging over the top of your skirt, trousers, shorts, etc. 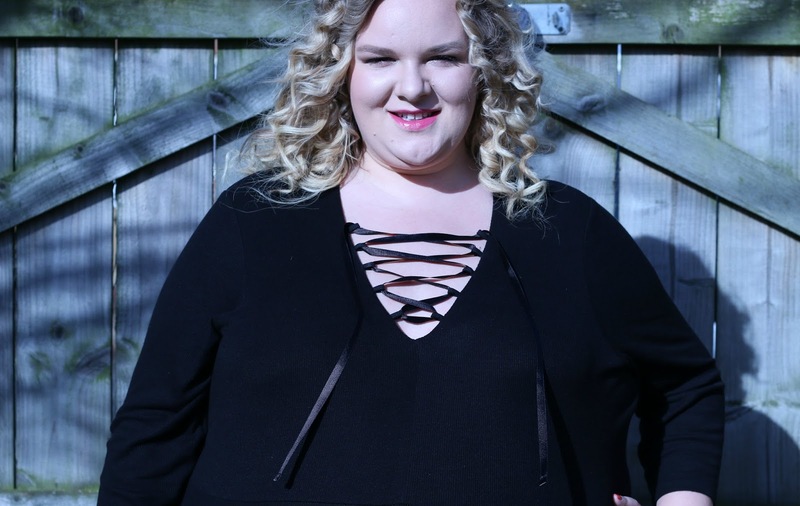 This one is the RI Plus Black Lace-Up Bodysuit and I’ve got to say that it does exactly what its supposed to and it looks great while doing it. The lace up detail really reminds me of tops that were available in the 90s and I love how well made the garment is. I was a little concerned as to how I would be able to fasten it (big tummy plus sizes will know what I mean) but it was fairly easy to do after sitting on a chair in my bedroom. Once it was on, it was pretty comfortable to wear, although it was a little strange to get used to at first as I’m not used to wearing anything like this. This bodysuit has loads of stretch in it, the fabric is thick and superb quality so it moves with your body and fits to your curves perfectly. I would say that it is true to size however those who are longer in the body like I am or those who have a lower hanging tummy, like I also do, may find that it is a little short. It does fit thanks to the fabulous ribbed stretch in it but for my shape specifically, it could have done with being a fraction longer. To show the smooth, sleek silhouette that it creates under clothes, I paired it with my favourite plus size leather look leggings to snap these photos. As you can see it smoothes under the leggings effortlessly, without bunching up over the top. So if you’re someone who likes to wear your top tucked into your bottoms then one of these body suits would be absolutely ideal for you. Personally, I prefer to wear longer tops, so as to not draw too much emphasis to my middle, however I will definitely wear this body again but pair it with a maxi skirt, skater skirt or some baggy, printed trousers; something that’s more loose that won’t cling to my tummy because I actually really liked the close fitting feel of the body… on my body! I’d love to know how you would style a bodysuit on your own body shape or if you have any recommendations as to what I could pair this one with. The lace up detail is new to me and now I just need to find something awesome to pair it with! What do you think of River Island clothing? You look amazing! I don't think I will look good in one, unfortunately. Love the shoes too. Great look! I think you look fantastic, and so brave for pushing yourself out of your comfort zone. The body suit sounds like a great idea and I like the lace up detail. This takes me back to the late 80's when they were all the rage! and even back then I didn't really like them. Poppers around the crotch nightmares spring to mind if I remember correctly! You look lovely and well down for branching out and being brave!